When you encounter a duplicated error, you'll want to create a new 'group'. Select one or more errors from the same environment in the error Items feed. Slide the toggle in the box above to 'Merge', set appropriate Level, Status, Owner, and Source values, enter a name for the new item, and click 'Merge'. Done, error merge success! Merged the wrong error by mistake? No problem! You can easily un-merge errors in Rollbar. 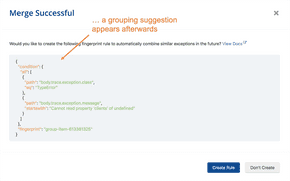 By default, errors which have been merged into a group will no longer appear. To view these errors, you can search for is:member. To only show grouped errors, you can search for is:group. We hope that you and your team will save more time in your day-to-day debugging efforts with Error Merging. 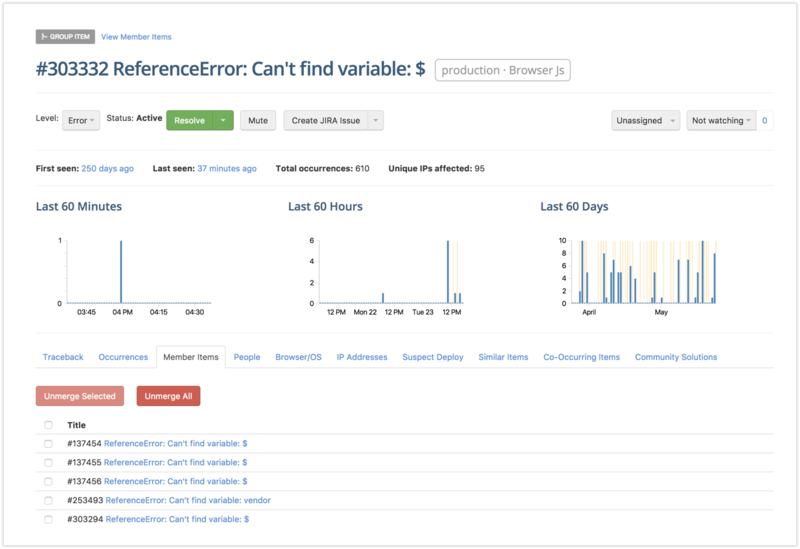 Check out the error merging documentation for more details. We appreciate your feedback. Email support@rollbar.com and let us know your thoughts.